The Trinity ranks as the greatest mystery of Christianity. Here’s another Trinity Sunday sermon, preached on 15 June 2014. We live in a nation of restless souls. The children of immigrants founded America. Immigrants, either voluntary or involuntary, built our nation. People from around the globe still travel here to escape ancient prejudices, recent debts, and class restrictions, believing in the dream of creating new lives for themselves and their children. Even native-born Americans wander. We live in the most mobile nation on the planet. Americans think nothing of moving across the continent for a better job. We travel worldwide on vacations. We constantly look for something to fill our hearts, clear our minds, or bring excitement to our lives. I see an opportunity here. As I see it, we have everything necessary to fulfill one of Jesus’ greatest desires: The desire of His people to go and proclaim the gospel. Today, the Church celebrates “Trinity Sunday,” the Sunday on which we clearly teach one of the greatest the mysteries of the Christian faith: One God, Three Persons, each completely independent yet completely One with one another. Our belief in the Trinity separates Christianity from the other monotheistic religions. I believe it also gives us a fuller picture of God and helps us understand how God works in us to carry out His desire for the salvation of humanity and all creation. After His resurrection, Jesus met the disciples in Galilee. St. Matthew recorded that Jesus had “directed” the disciples to go to a certain mountain in Galilee where He met them. We don’t know to which mountain St. Matthew referred, but we know the disciples obeyed Jesus and met Him there. On this mountain, Jesus appeared to His disciples. St. Matthew wrote, “when they saw him they worshiped him, but some doubted.” The disciples recognized Jesus as worthy of worship. Remember, all the original disciples believed in one God. As Jews, they had recited Moses’ teaching their entire lives: “Hear, O Israel: The LORD our God, the LORD is one. You shall love the LORD your God with all your heart and with all your soul and with all your might” (Deuteronomy 6:4-5). To the Jews, God and God alone deserved the worship of His people. St. Peter had already spoken for the disciples in his great confession of Jesus’ identity: “You are the Christ, the Son of the living God” (Matthew 16:16). Jesus’ resurrection further convinced the disciples of His deity. Notice that although all the disciples worshiped, “some doubted.” I don’t think this should surprise us. Those of us who have lived inside the Church our entire lives often take for granted what we ask people to believe about Jesus. We ask people to believe in a man crucified by the Romans who then came back to life after lying dead in a grave for 3 days! Even the original disciples had trouble understanding what had happened, and they saw Jesus face to face after His resurrection. People sometimes need more tangible evidence of Jesus’ resurrection, of His life within His Church. More on that later. As the disciples worshiped, Jesus told them, “All authority in heaven and on earth has been given to me.” Who gave Jesus, the Son of God, this authority? Only the Creator, God the Father, could grant this authority. Jesus had actively participated in the creation of all things, but as St. Paul wrote to the Philippians, He had “emptied Himself” of His heavenly attributes to dwell among us (Philippians 2:7). At His resurrection, Jesus received the authority of all creation, an authority He had possessed since the foundation of the world. Because all authority rests with Jesus, He can command His people to carry the gospel, the good news, of His death for humanity’s sins and of His resurrection, by which He defeated sin and death. “Go therefore and make disciples of all nations.” Jesus sent His disciples throughout the world, empowering them through the Holy Spirit to teach all He had commanded them and to make disciples of all who believed their message. Once people believed the message of the gospel, Jesus told the disciples to baptize them “in the name of the Father and of the Son and of the Holy Spirit.” Everything proceeds from God the Father; salvation comes from the finished work of God the Son; conviction and belief comes from the work of God the Holy Spirit, who draws us to the cross of Christ for salvation and indwells us that we may know what God expects of us and how to live as Christ commands us. Through God the Holy Spirit, Christ could truly say, “And behold, I am with you always, to the end of the age.” The omnipresent Holy Spirit constantly reminds us of Jesus’ presence in our lives. One God, Father, Son, and Holy Spirit; One Church, composed of all who believe the message of the Apostles; one great command, to go and make disciples. How does this command apply to us today, at New Hope? For one thing, I believe that we cannot go anywhere until we’ve arrived at the place where God can use us to carry the gospel. Too many Christians today have come to treat church as an option or an obligation. I don’t want you to see worship as an option; for a Christian, worship comes with the privilege of calling yourself a child of God. I want you to see worship as an opportunity to praise God for your salvation. I want you to see worship as an opportunity to pray for those around you, the hurting, hurtful, sorrowful, stubborn people who need Jesus. You cannot worship God in spirit and truth (John 4:23) without genuine conversion and repentance. For too long, too many Christians have desired Jesus’ salvation without accepting His command to live holy lives. I see a serious problem here. How can we go and tell others of Jesus when we refuse to live godly lives ourselves? “Why would you say this, John?” I’m glad you asked. Let’s go back to Jesus words. In the English translations, the word “Go” appears as a command. Greek has an imperative tense, but Jesus didn’t use it when He said to “go.” The tense Jesus used here better implies, “As you go.” You cannot make disciples unless you go out as a disciple yourself. “As you go” means you will always show the people around you, in your everyday life, what it means to live as a disciple of Jesus. That poses a problem for many. The people around you may hear you say all kinds of good things about your God and your church, but they also see how you live as you go through your life. I said earlier that people need tangible evidence, clear evidence, of Jesus’ resurrection. Your lifestyle must provide that evidence. Christian, your life, your actions, your words, your desires, will prove Jesus’ resurrection more than anything else I can mention. Does your lifestyle assist the Church in making disciples? Do your actions bring people to Jesus, or do they drive them away? Let’s take this to the congregational level. We’ve all enjoyed celebrating our big anniversary this year. I enjoyed the celebrations last week. However, we cannot rest on what we’ve done over the past 175 years without looking ahead and moving forward. Jesus has commanded us to make disciples in this community. Have we done everything necessary to reach our communities and our area for Christ? If not, what must we do? First, I issue a call for repentance. We’ve treated church as an option, and then we wonder why our children decide not to worship at all in their adulthood. Church will rarely rank higher in their priorities than it does in ours. If you treat worship as merely an option (or even worse, an inconvenient obligation), you children will see it that way as well. Our children and our community see the lives we live outside the walls of our sanctuary. We must show them we believe in Jesus’ salvation through our own lives. If you’ve allowed something else to come between you and God, pray for genuine repentance and forgiveness. Only then can the Holy Spirit guide you to go and make disciples. Secondly, I issue a call to our congregation to minister to our communities. The communities of our area have grown exponentially in the past decades. Had the churches in our areas grown as quickly, we would all have grown exponentially as well. Why haven’t we? What has hindered us from reaching those who have moved here? We, too, must repent for not reaching those God has placed around us. We must do whatever we find necessary to minister to the people around us and bring them to the cross of Christ, our Redeemer. Lastly, I call on you to look ahead and decide what kind of congregation we will pass to our children. Will the people of New Hope one day celebrate our sacrifices or mourn our timidity? I’ve never met a timid person in this community. I believe God has given us a holy calling, a glorious calling, to build a congregation worthy of passing to succeeding generations. I know we’ve had our fun celebrating our past. I know many in the Church today, especially in America, believe the world will eventually get too bad for anyone to do anything about it. Yes, I’ve read the Scriptures, and yes, I know that times will come in which it appears the saints have lost. Those times have come in the past, and the Church has triumphed. Jesus assures us He possesses all authority in heaven and on earth. Forget everything you’ve ever read about how bad it will get, because you’ll never read anywhere where Jesus gives us the option to surrender. Go, and live in victory! Jesus has won, and so will we! We’ve sat and celebrated. Now, we must go to the cross in genuine repentance and receive the forgiveness of our sins as we confess them to Christ. Go, and make disciples by showing everyone that you have become a disciple yourself. Go, and in the name of the Father, of the Son, and of the Holy Spirit, bring your community to the cross and empty tomb of our Lord for salvation and service in the name of God. The Church celebrated Trinity Sunday this past Sunday. This sermon comes from a series on Romans from 2008. Each year, the Church dedicates the Sunday following Pentecost to one of the most crucial — but yet most misunderstood — doctrines of the Christian faith: The Doctrine of the Trinity. Our belief in 1 God in 3 Persons separates Christianity from both Judaism and Islam, the other monotheistic faiths of humanity. Some scholars have tried to prove that the early Church didn’t truly understand the Trinity, even going so far as to claim that Jesus Himself did not understand His relationship with the Father. Given the teachings of Christ included in the Gospel of St. John, I find it difficult to believe that Jesus misunderstood His identity when He claimed to be the Son of God the Father. “I and the Father are one” (John 10:30), “Whoever has seen me has seen the Father” (John 14:9), “That they may be one even as we are one” (John 17:11, 22); these statements clearly depict Jesus as claiming perfect unity with the Father, the God of the Jews. Today’s sermon text also contradicts any notion that the early Church failed to grasp the concept of the Trinity or the importance of the doctrine. St. Paul wrote his letter to the Romans in c. A.D. 57, or roughly 24-25 years after Jesus’ crucifixion, resurrection and ascension and possibly before the composition of at least 3 of the Gospels (St. Matthew, St. Luke and St. John). The opening words of St. Paul’s letter provide clear evidence that he both perceived and understood the working of the Trinity in the salvation story that the Church proclaims to the world. Few books can claim the impact of the book of Romans on Western Civilization. Romans was instrumental in St. Augustine’s conversion. After reading Romans 13:13-14, Augustine wrote, “I had no wish to read more and no need to do so. For in an instant, as I came to the end of the sentence, it was as though the light of conﬁdence ﬂooded into my heart and all the darkness of doubt was dispelled.” (Augustine’s Confessions (London: Penguin Books, 1961) p. 178). Martin Luther would read Romans and become convinced that salvation was accomplished solely by justiﬁcation through faith. This insight would lead him to challenge the Roman Catholic Church and centuries of doctrines. John Calvin would read Romans and become convinced that God’s sovereign plan unfolded in time in spite of the worst attempts of evil to confound it. St. Paul wrote Romans while he was in Corinth. St. Paul wrote Romans to prepare the Roman church for his visit on his way to Spain (15:28). St. Paul was writing to a church he did not found; therefore, he could not exert any authority over them without an introduction. The letter to the Romans is Paul’s longest letter. The letter itself is a tightly written argument for the necessity of God’s righteousness in life, for the love of God demonstrated in Jesus’ sacriﬁce, for the inclusion of the Jews in God’s salvation plan, and for the continued presence of visible proof in Christians’ lives that a spiritual birth has occurred in their lives. Today, we also see that St. Paul clearly taught the doctrine of the Trinity through his masterpiece work. Many people wonder why Christians so emphatically cling to the doctrine. When we begin reading the letter to the Romans, we find several reasons why the Trinity speaks so dearly to believers. First, St Paul reminded the believers at Rome of Jesus’ identity as the Son of God. St. Paul called himself a “servant of Christ Jesus, called to be an apostle, set apart for the gospel of God.” St. Paul recognized Jesus as his Lord and King. Saul the Pharisee had believed in God; he had often quoted the Shema, the declaration of Moses that Jesus called the first commandment: “Hear, O Israel: The LORD our God, the LORD is one” (Deuteronomy 6:4). 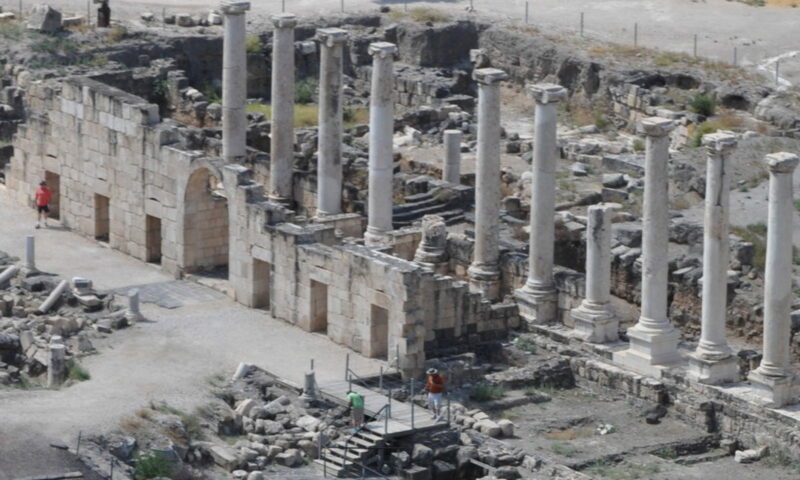 When the Christian movement began sweeping through Judea, Saul attacked the believers as heretics. However, on the road to Damascus, Saul encountered a living Jesus. Saul quickly realized that Jesus lived again, changing his perception of the God he had loved and served his entire life. Saul — now known as Paul — realized that Jesus had set him apart for a special purpose. First, Jesus called him as an “apostle,” or “sent one.” An “apostle” in the Greek world served as a messenger with a special message to those entrusted to his mission. St. Paul knew his message: the “gospel of God.” At this point, God the Father entered the conversation with the Roman believers. God the Father had revealed Himself to Abraham, Isaac, Jacob, and Jacob’s descendants as the God of the Covenant. He had first made a covenant with Abraham: “I will surely bless you, and I will surely multiply your offspring as the stars of heaven and as the sand that is on the seashore. And your offspring shall possess the gate of his enemies, and in your offspring shall all the nations of the earth be blessed, because you have obeyed my voice” (Genesis 22:17-18). God had confirmed this covenant with Isaac and then with Isaac’s youngest son Jacob. On Mt. Sinai, God again confirmed His covenant with Jacob’s descendants through Moses, calling Israel — the tribes descended from Jacob — as a “ a kingdom of priests and a holy nation” (Exodus 19:6). Throughout Israel’s history, God had sent prophets proclaiming His coming. In time, the prophets began predicting a strange event in history: God would come to the earth as a human, more specifically as a descendant of David, Israel’s greatest king. Practically every major prophet from Moses forward prophesied regarding the coming of God in flesh. Unfortunately, these prophecies also included those of Isaiah that God would suffer and die for the sins of His people and for the sins of all humanity. St. Paul reminded the Romans that Jesus’ resurrection following His sacrificial death firmly established His identity as the Son of God, just as He had claimed (John 10:36). Christians from the resurrection forward clearly proclaimed Jesus’ identity in this way, beginning with some before His death (cf. Martha, John 11:27) and emphatically afterward (John 20:31). After his own conversion and calling, St. Paul himself had “proclaimed Jesus in the synagogues, saying, ‘He is the Son of God’” (Acts 9:20). St. Paul also reminded the Romans of the Holy Spirit’s work in salvation history. Jesus had promised to send another “Comforter” or “Advocate” to indwell believers after He ascended to the Father (John 14:16-17). On the day of Pentecost, the Holy Spirit came into the world and empowered believers to carry the gospel of God to all humanity (Acts 2). The Holy Spirit goes everywhere that believers go, giving us the courage and wisdom to proclaim Jesus as the “Son of God” through His resurrection. Once we hear this proclamation — Jesus has died for our sins, risen from the dead, and now offers freedom from sin to all who believe in Him as Lord — we receive “grace.” Grace refers to the undeserved merit we receive from God, who forgives us of our sins against Himself and against others and declares us as “justified,” or having the standing to approach Him knowing He has forgiven our sins. St. Paul then addressed the Roman believers directly, reminding them they were “called to belong to Jesus Christ;” the Holy Spirit had worked in their hearts to convict them of their sins and bring them to salvation through their confession of Jesus as Lord of their lives. One of the Church Fathers, a man known as Ambrosiaster, stated that the Roman Christians accepted Christianity without any notable miracles and without any apostolic proclamation of the faith. Most likely, Jews from Rome were present at the events of Pentecost and carried the new faith back to Rome itself. St. Paul opened the main portion of the letter with a new form of the customary salutation in Greek letters: “Grace to you and peace from God our Father and the Lord Jesus Christ.” Greek letters often opened by wishing “grace” to the recipient of the letter, but St. Paul added “peace” to his salutation. St. Paul reminded the Romans both of the grace they received through their salvation and the peace with God that their confession in Christ had brought. I believe these verses remind us today of the Trinity’s work in our own salvation. First, we must remember that when we confess Jesus as Lord, we must live according to His expectations and commandments. We cease our service to self and sin and begin serving our new Lord, who calls us to proclaim His resurrection to the world. The gospel consists of the good news that while all humanity suffers from our sins, Jesus has paid the penalty and conquered both sin and death through His crucifixion and resurrection. We should also find encouragement in the prophecies regarding Jesus’ coming. These prophecies remind us that God the Father, in His omniscience, knows what we faced in life and what we will face in the future. He has already prepared for what we will face later today and for the rest of our lives. This fact should lead us to trust Him even more in our lives. If we can trust God for our salvation from sin, we can also trust Him to provide for us and guide us in life. The Holy Spirit Himself (remember that the Holy Spirit is God, not an emotion!) also works in us. He helps us to live godly lives as a witness to His work in us. He also works in unbelievers to draw them to Jesus, pointing them to the only true source of salvation: Jesus Christ, the Son of God. The God we serve — Father, Son, and Holy Spirit — cares deeply about you. Everyone who confesses the Son as Lord finds peace with the Father and experiences the calming presence of the Spirit. The joy of our faith revolves around the love of God for us, a love that extends beyond the love of the Persons for one another to encompass us as well. You’ll find no stronger love than the love of the Trinity for one another and for all believers in Jesus Christ, the Son of God.